Memphis has enhanced two parks and a public library through its participation in Reimagining the Civic Commons, a national initiative intended to promote inclusivity in public space in five U.S. cities. But one of those parks has a Jefferson Davis statue, and the other was, until recently, named Confederate Park, and critics say the site choices undermine the very goals of the project. Memphis’ piece of the philanthropically funded Reimagining the Civic Commons was dubbed Fourth Bluff, and Sawyer thinks any project intended to foster inclusivity shouldn’t have started with these parks — unless the organizers were ready to tackle the racist legacy head on. The two parks, located along the downtown waterfront, are separated by a steep change in elevation and a road with fast-moving traffic. Though they’re close together, they don’t feel connected. As part of a series of activations, the city closed the roadway to traffic for the summer, painted on basketball courts, and added shade, lighting, chairs, ping-pong, and other games. So far, some Fourth Bluff pop-ups have been more successful at drawing a diverse crowd than others. Attendees of a pop-up ice rink this winter represented a wide range of ages, races, socioeconomic statuses and Memphis neighborhoods, according to information participants provided on waivers. Same for the basketball courts. But events like a pop-up beer garden drew primarily from downtown workers, and didn’t bring in attendees from other neighborhoods. “What we’re starting to find is the more active uses bring in the more diversity, whereas just coming down to hear music and drink beer appeals to not as broad an audience,” says Spence. These are the lessons the city is hoping to learn at Fourth Bluff over the course of the three-year project, and to apply to other city parks. Permanent changes will also include landscaping the lower park as a children’s play area and adding a space for fishing and launching nonmotorized boats. The upper park may get a collapsible stage, gardens and a dedicated space for yoga. Last week the bimonthly free yoga class there drew over 100 people. One wonders who chose not to attend because Jefferson Davis was there too. She says the city chose these parks intentionally in order to further a conversation around what should happen to confederate monuments. After the city voted to remove the Nathan Bedford Forrest statue in 2015, Tennessee state lawmakers voted to require approval from the Tennessee Historical Commission before moving statues of historic military figures. Memphis’ application was denied. The city has appealed, but the commission may once again change the rules to prevent the statue’s removal later this month. All of this applies only to Forrest. The city has not asked for a waiver to remove Davis, only to temporarily change the name of the park in which he sits. In both cases, Sawyer says the city could do more, like sell the parks to nonprofits for a dollar, allow them to remove the statues, and then buy them back. Not doing so sends a message to black residents, she says, and casts a pall over the Fourth Bluff project. “To me it says we don’t care,” says Sawyer. 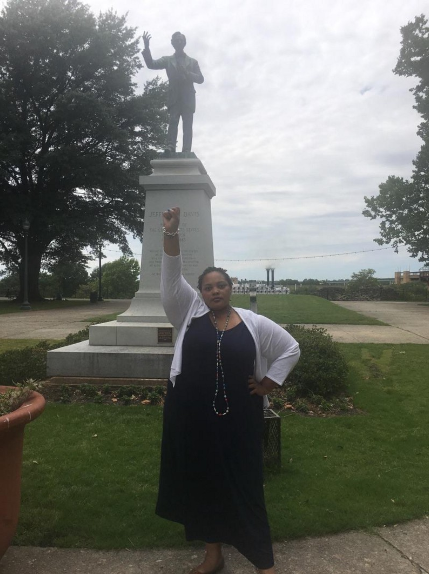 Two days after New Orleans removed a confederate monument, Sawyer was at Memphis’ Jefferson Davis statue to give an interview. Confederate apologists were there waving flags. She’s organizing a June 20 community conversation about the statues. The Fourth Bluff is gearing up for another round of Friday pop-ups, and a whole summer of programming, including a beer garden and outdoor concerts. Sawyer won’t be there.